Veteran actress Sripriya who has acted in over 200 films in Tamil, Telugu, Kannada, and Malayalam, is going to direct a bi-lingual film (Tamil and Telugu) which will be a remake of last year's Malayalam hit 22 Female Kottayam. 22 Female Kottayam was “inspired” (plagiarised would be more appropriate) by the Hindi film Ek Haseena Thi (2004). Reema Kallingal, who played the main role, won the Kerala State award for her compelling performance. Sripriya has confirmed Nithya Menen, for the lead role but she is yet to choose the male lead. Sripriya has acted with MGR, Sivaji Ganesan, Kamal Haasan, Rajinikanth, in many successful films. “Having worked in strong, woman-oriented films as an actor, I have chosen a strong woman-centric theme as my directorial venture,” she said in a press release. She will shoot the Tamil and Telugu versions simultaneously. The shooting will start in July and she is looking at a December release. 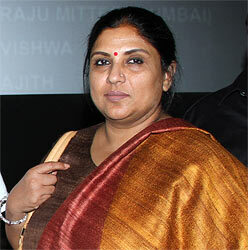 Sripriya is also looking for an interesting title for the film and waiting for suggestions from film lovers! Quiz: Know Sivaji Ganesan, Rajinikanth, Kamal Haasan well?